A Matter of Memories: :SALES: 12% off All Summer-Themed Embellishments @ Scrapbook.com...TODAY only! 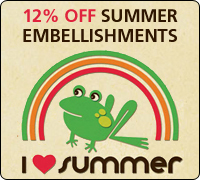 :SALES: 12% off All Summer-Themed Embellishments @ Scrapbook.com...TODAY only! You'll have lots of great summer photos to scrap soon! Stock up for all you embellishment needs today using this great discount opportunity at Scrapbook.com! Take 12% off the lowest marked price on ALL Summer-Themed Embellishments, today only! No coupon code is required - discount will appear automatically in your cart. Hurry - this offer expires today at midnight PST!